Yanar Dag (Azerbaijani: Yanar Dağ, meaning "burning mountain") is a natural gas fire which blazes continuously on a hillside on the Absheron Peninsula on the Caspian Sea near Baku, the capital of Azerbaijan (a country which itself is known as "the Land of Fire"). Flames jet into the air 3 metres (9.8 ft) from a thin, porous sandstone layer. Administratively, Yanar Dag belongs to Absheron District of Azerbaijan. 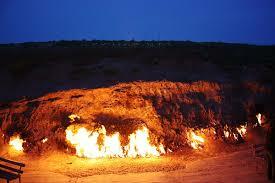 Unlike mud volcanoes, the Yanar Dag flame burns fairly steadily, as it involves a steady seep of gas from the subsurface. It is claimed that the Yanar Dag flame was only noted when accidentally lit by a shepherd in the 1950s. 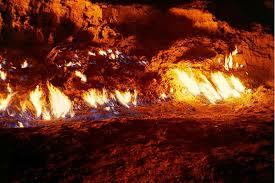 There is no seepage of mud or liquid, which distinguishes it from the nearby mud volcanoes of Lökbatan or Gobustan.